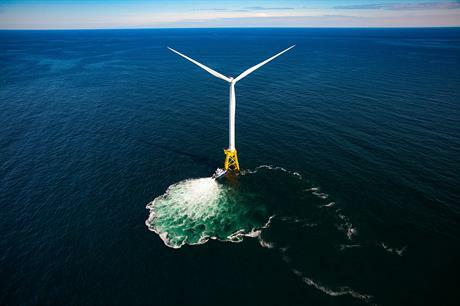 UNITED STATES: Projects developed by Vineyard Wind and Deepwater Wind have been selected to provide up to 1.2GW of offshore wind capacity in Massachusetts and Rhode Island respectively. The 800MW Vineyard project, a 50:50 joint venture between Avangrid and Copenhagen Infrastructure Partners, was the winning bid in the US's first offshore wind request for proposals (RfP) off Massachusetts. It was chosen by three utilities operating in the state: Eversource Energy, the National Grid and Unitil. Regulators must still approve the contracts. Vineyard Wind said it was the only developer who responded to the RFP that had also started both the state and federal permitting processes. The project is to be completed by 2021. Under a 2016 law, Massachusetts requires its utilities to buy 1.6GW of offshore wind by 2027. A partnership between Denmark's Ørsted and Eversource also put forward in the RfP a bid that included part of its 1GW Bay State wind project, plus 55MW of battery storage. Acknowledging the result, Ørsted said it remained commited to developing offshore wind in the US. "We submitted what we considered a very competitive, but value-creating bid. While we're of course disappointed by the outcome of the solicitation, the US remains a key market to us," said Martin Neubert, CEO of wind power at Ørsted. "Together with Eversource, we'll continue progressing our Bay State Wind project towards the next solicitations in New England and New York. Ørsted will also continue to develop our utility scale Ocean Wind project in New Jersey, and we remain engaged with our partner Dominion Energy in bringing offshore wind to Virginia," Neubert added. In the neighbouring state of Rhode Island, officials awarded a 400MW offshore wind procurement to Deepwater Wind for its Revolution project, to be online in 2023. Rhode Island's procurement was carried out in collaboration with Massachusetts'. "Rhode Island pioneered American offshore wind energy, and it's only fitting that the Ocean State continues to be the vanguard of this growing industry," said Deepwater Wind CEO Jeffrey Grybowski. Deepwater Wind will now negotiate a contract with National Grid, which must in turn seek approval from regulators, said the Rhode Island governor's office. Elsewhere on 23 May, New Jersey governor Phil Murphy signed a law that commits the Mid-Atlantic state to buying 3.5GW of offshore wind by 2030, the largest such obligation in any US state. The newly signed New Jersey law also reinstates tax credits for offshore wind manufacturing. They had expired under the previous governor, Chris Christie. Following the spate of announcements in the US's germinal offshore sector, the American Wind Energy Association (AWEA) CEO Tom Kiernan said: "With world-class wind resources, infrastructure and offshore energy expertise, the US is primed to scale up this industry and lead it." The results in Massachusetts and Rhode Island, and New Jersey's new law follows the launch of a new RfP in the state of Virginia seeking information about its potential offshore wind supply chain.